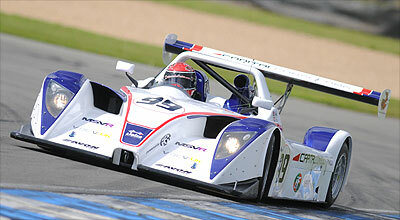 Barry Gates & Anthony had mixed fortunes in the first race of the 2008 V de V series. 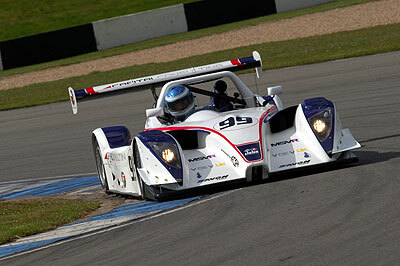 Despite limited Donington testing, in a tricky wet-dry qualifying session, they took 5th position on the grid in their Ligier JS49. In the race, they were hampered by gear selection problems, but Barry still produced a solid performance in the opening stint to stay in touch with the mid-field group. However, he was caught out by a rain shower after 45 minutes, causing him to slide off the track and become beached in the gravel at Redgate corner. Remarkably, despite loosing 4 laps he was dragged out by a recovery tractor onto the track and back into the race! At mid-distance the Chevron racing team did an excellent job to refuel the car and change drivers and Anthony took the second stint. Despite the gear problems, he still produced lap times that were competitive and battled through the pack. He had a good race with ex-F3 driver Charlie Hollings, overtaking his friend on the outside at Redgate and eventually took 8th place as the red flag was thrown 15 minutes early due to a stricken car on track. "That was a baptism of fire, but at least we finished!" said Anthony. "We were lucky to still be going at all after the gravel trap moment, but we picked up a good handful of points, which may be helpful later in the season. We need to do a bit of work to be more competitive, but we know where the time is to be gained and we'll be more on the case at the next round."